Rafael de Cabo. Leader of the Translational Gerontology Branch at The National Institutes of Health (NIH), Baltimore. Ana M. Cuervo. Co-director of the Einstein Institute for Aging Research, and member of the Einstein Liver Research Center and Cancer Center, New York. Guido Kroemer. Full Professor of the Centre de Recherche des Cordeliers Paris Descartes, Paris. Valter Longo. Edna M. Jones Professor and Director of the USC Longevity Institute at University Southern California. Pablo J. Fernández-Marcos. Group Leader of the Metabolic Syndrome Group at IMDEA Food Institute, Madrid. Ana Ramírez de Molina. Director of the Precision Nutrition program and cancer, and Deputy Director at IMDEA Food Institute, Madrid. Manuel Serrano. Group Leader of the Cellular Plasticity and Disease Group at the Institute for Research in Biomedicine (IRB), Barcelona. David Sinclair. 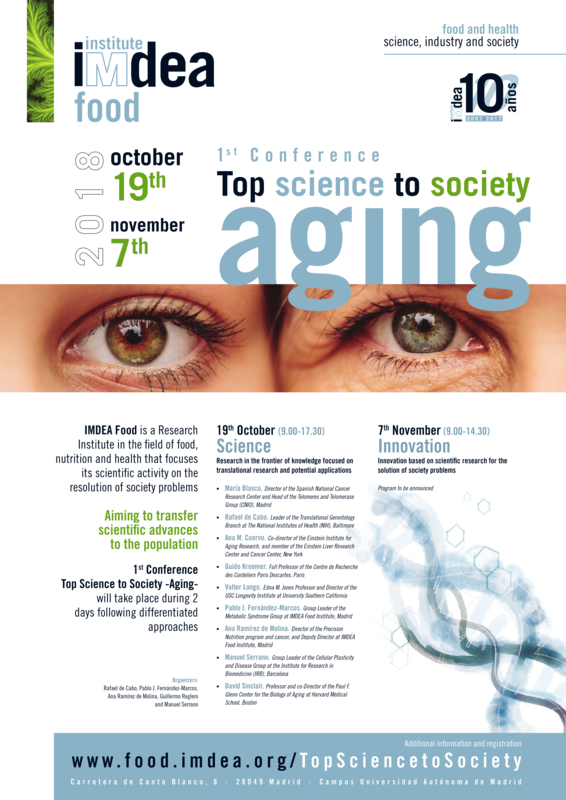 Professor and co-Director of the Paul F. Glenn Center for the Biology of Aging at Harvard Medical School, Boston. Addressed to: Researchers and scientific personnel interested in this field. Carretera de Canto Blanco, 8. 28049 Madrid. Campus Universidad Autónoma de Madrid. Registration fee: Free. Registration is required. Assistance to be confirmed by IMDEA Food via e-mail according to availability and registration order. Rafael de Cabo, Pablo Fernández-Marcos, Ana Ramírez de Molina, Guillermo Reglero and Manuel Serrano.